Pace Palo Alto is pleased to announce an exhibition of works by Louise Nevelson, highlighting the artist’s practice from the mid 1950s until her death in 1988. The exhibition will be on view from September 29 through December 11, 2016 at Pace Palo Alto located at 229 Hamilton Avenue in California. An iconic and vital figure in post-war New York, Louise Nevelson was widely regarded for her groundbreaking sculptural environments as well as her collages, both of which will be in this large survey show. Nevelson created her first assemblages in the mid-1950s and quickly made an impact in the New York art scene with her pioneering approach to sculpture. Inspired by Cubism, Nevelson took scraps of wood and other materials found on the street near her studio and assembled them into free-standing and wall-mounted sculpture that she would paint a solid color—most famously, black or white. 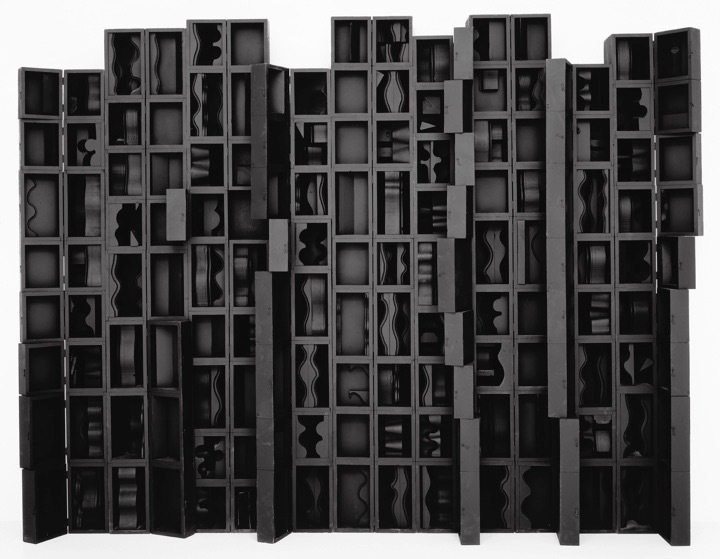 Nevelson’s sculptures range from small assemblages to free-standing columns and monumental wall-based works consisting of multiple small compartments. Although the physical form of the scraps remains unchanged in her work, Nevelson subsumes them in an entire system, creating a unified whole from disparate parts. She insisted on the psychological and expressive virtue of her work, which was illustrative of a highly personal cosmology rooted in light and shadow. The artist’s early collages, produced at a smaller size than most of her sculptures, provide important insight into her thinking and working process and the importance of wood in her work. Mostly unpainted, the collages reveal Nevelson’s use of raw materials, demonstrating an organizational logic that continues in her larger work as well. In addition to Nevelson’s iconic black monochrome sculptures, the exhibition will also include steel maquettes Nevelson produced for public sculptures, now exhibited in Chicago and at Harvard University. These works, intended to be viewed in the round, exemplify the heightened architectural quality of her work in the later decades of her career. Artwork © 2016 Estate of Louise Nevelson / Artists Rights Society (ARS), New York. Courtesy Pace Gallery.